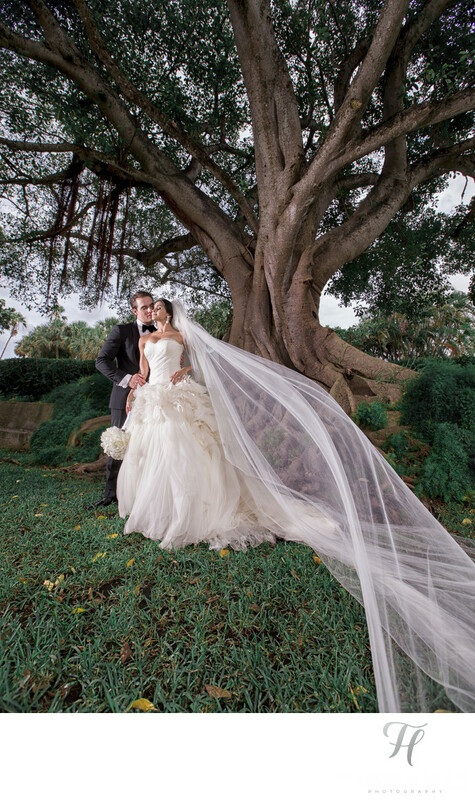 A shot that I have done before, and will continue to do at the Biltmore Hotel is this tree shot. It is so wonderful. I love shooting this with the wide lens, and in this case I am actually holding the end of Leslie’s veil near the camera for effect. The long flowing veil “mimics” the tall flowing tree branches, and is visually very appealing. Leslie is rocking her “Vera Wang” wedding dress and it looks stunning. To help with that, I have paid very special attention to the lighting used for this shot. I have set the lighting off to the camera left side of the shot. This make it very directional and not "flat". When lighting is "flat" it creates no shadows, and comes from the same direction as the camera. This is never flattering, and evokes no emotion. SO, to correct that I need to take control and make the lighting work for me, and the situation. Now, I have a scene that contains texture, and dimension and that is key when the goal is a very impressive, dramatic shot like this. You can see more from their wedding here. I also want to mention, how important it is to have enough time on the wedding day to in fact get shots like this! I would consider either doing a "firstlook" or perhaps even setting up a time on another day to go and get creative shots that would normally be impossible to do on the wedding day itself. Location: 1200 Anastasia Ave, Coral Gables, FL 33134.